The Daily Beast is an American news reporting and opinion website founded and formerly published by Tina Brown, former editor of Vanity Fair and The New Yorker as well as the short-lived Talk Magazine. 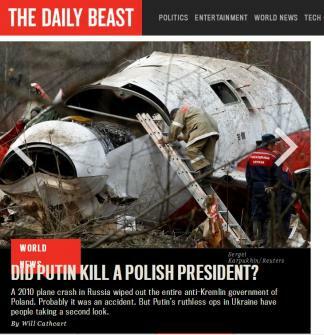 The Daily Beast was launched on 6 October 2008, and is owned by IAC. John Avlon, an American journalist and political commentator as well as a CNN contributor, is the site’s executive editor, and Rhona Murphy is its interim CEO. Brown stepped down as editor in September 2013. The name of the site was taken from a fictional newspaper in Evelyn Waugh’s novel Scoop. On 12 November 2010, The Daily Beast and Newsweek announced a merger deal, creating a combined company, The Newsweek Daily Beast Company. On 3 Aug 2013 IAC, owner of The Daily Beast, sold Newsweek to IBT Media, owner of the International Business Times. Did Putin Blow Up the Whole Polish Government in 2010? A Second Look. A plane crash at Smolensk in Russia four years ago wiped out the Warsaw leadership. It used to be seen as an accident. 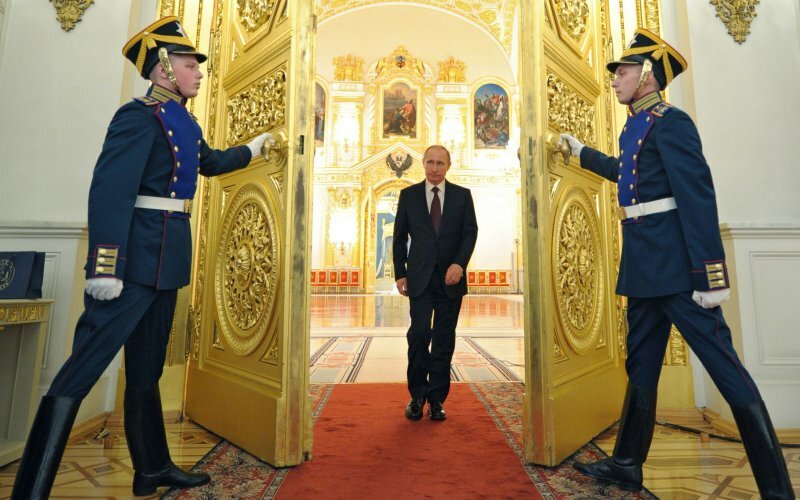 Now, after Putin’s games in Ukraine, people aren’t so sure. Four years ago this week, Polish President Lech Kaczynski was killed in a plane crash near the Katyn Forest in Russia where he was flying to honor the 22,000 Polish officers, lawyers, priests and professors slaughtered there by the Soviets 70 years before. Ninety-five other military, political and public figures including his wife died on that plane. One of the more heartbreaking details to emerge was that First Lady Maria Kaczynska’s body could be identified only by her nail polish and the inscription inside her wedding ring. Less than two years before the crash the late president had given a speech warning that if Russian aggression was not stopped in Georgia, which Russia had invaded, it would extend to Ukraine, the Baltics, and possibly Poland as well. “We are here to take up the fight,” he said. And many Poles still believe that their president died in the cause of that effort. Physicist Kazimierz Nowaczyk is one of them. On April 10, 2010 at 10:41 a.m. Polish Air Force Flight 101 crashed several hundred meters short of the Smolensk runway in dense fog. Within hours the Russian government issued a statement citing the incident on pilot error. Russia’s final report on the incident blamed the late President Kaczyński and his “inebriated” air force commander-in-chief for using “psychological pressure” to force the Polish pilots to land in a low-visibility environment. The plane’s black boxes, laptops, sensitive documents, mobile phones, address books, telephone numbers, correspondence, and the top-secret military, NATO and diplomatic codes on board were salvaged from crash site immediately by the Kremlin’s operatives in what was a “coup for Russia’s intelligence service” according to retired CIA analyst Gene Poteat. What Nowaczyk calls “years worth of work for security services” was completed in a single day by Russia’s OMON Special Purpose Police, which were immediately deployed to the site. The airplane was a 20-year-old Russian Tupolev-154M that had been refurbished and upgraded in Russia four months before, a detail that has become the subject of considerable speculation on the many forums and groups dedicated to investigating the conspiracy theory surrounding the flight. In an interview with The Daily Beast, Nowaczyk describes the findings of an independent Polish parliamentary committee investigating the crash of which he is a member. The group consists of scientists from various backgrounds and relies only on “scientific tools” in its investigation, he said. But the committee was formed by Polish parliamentary factions, such as that of the late president’s brother, Jaroslaw Kaczynski, who have not found the official Polish-Russian report on the incident satisfactory. The plane’s black boxes, laptops, sensitive documents, mobile phones, address books, telephone numbers, correspondence, and the top-secret military, NATO and diplomaticboard were salvaged by the Russians. “From our point of view this report was full of mistakes,” Nowaczyk explains, citing various inconsistencies and contradictions in the official narrative. A key issue raised by Nowaczyk’s committee and the many online forums dedicated to the crash is that the amount of debris found at the site—an estimated 60,000 aircraft fragments—would be impossible in the case of a simple plane crash. He cites the 1988 Lockerbie bombing and the 1996 TWA 800 flight out of New York, both of which exploded in the air but had only 11,000 aircraft fragments and 3,168 fragments respectively. Both planes were reconstructed to 95 percent completion. Nowaczyk believes that an explosion caused the fragmentation of the Polish president’s plane. In the official report the plane’s black boxes indicate that the aircraft’s electricity was cut two to three seconds before the crash, which Nowaczyk believes also was caused by that explosion. Earlier this week—on April 8, 2014—Polskie Radio reported that the Polish District Military Prosecutor in Warsaw, Colonel Ireneusz Szelag, presented 1,300 pages of documentation, in advance of the four-year anniversary, ruling out “any possibility that an explosion occurred aboard the Polish presidential plane that crashed in Smolensk on 10 April 2010.” The prosecutor stated, “After analysing 700 samples, experts found no traces that an explosion had taken place aboard the Tu-154 plane… The experts had unimpeded access to the site of the catastrophe, and to the place where the wreck of the plane is being stored.” The prosecutor stated that the investigation would be closed next year, even if the aircraft’s wreckage is not returned to Poland. That is not likely to calm the roiling tide of speculation about a conspiracy, especially in light of Putin’s recent actions in Ukraine. Already last year nearly one third of the Polish population believed there was a possibility that their president had been assassinated. The number is unusually high for a conspiracy theory, suggesting just how fearful Poland is about Russian intentions. But it is increasingly hard to separate the forensic aspects of the case from the intense political maneuvering around it in Poland. The incident has been used to fuel anti-Russian sentiment among far-right groups, to demonstrate anti-Russian credentials and to further political careers. The general public has every reason to be skeptical. Now at a time when anti-Russian sentiment is already running high, this theory could further embitter the Polish people if it continues to gather momentum and recognition. For the majority of the country and the mainstream media, supposition that the Smolensk crash was not an accident remains a fringe theory fraught with political implications. Those who propagate it are considered paranoids or activists with an axe to grind. But Putin’s performance over the last eight weeks has given the world good cause to revisit conspiracy theories, including some that only two months ago would have seemed ludicrous and absurd.